As the digital world runs faster, more and more businesses are turning to a cloud environment with scalability and agility, which provides up-to-date functionality and disaster recovery. Cloud solutions are the adaptable alternative to expensive on-premise technology. One of the biggest benefits of using a true cloud communications provider is that no matter what the size of your business, you can benefit from a great value, flexible solution which will transform the way you connect with your customers worldwide. NewVoiceMedia is a global provider of cloud technology, which helps businesses sell more, serve better and grow faster. A cloud customer contact solution from NewVoiceMedia provides a superior alternative to on-premise solutions and offers 24x7x365 customer support. 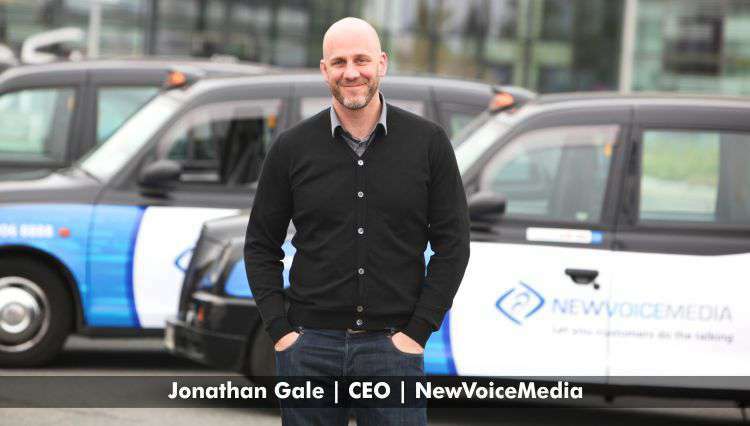 Jonathan Gale, CEO of NewVoiceMedia, has over 20 years’ experience in building technology businesses. He served for 10 years in the CRM and contact center industry, after which he held the position of VP of EMEA, Global VP of Sales & VP of Product Management at MessageLabs for eight years – which is now part of Symantec. Jonathan was later SVP of Product Strategy at Mimecast. He joined NewVoiceMedia in October 2010 as Chief Commercial Officer to manage sales, marketing and product strategy and then in February 2011, was appointed Chief Executive Officer. Jonathan explained how technology is growing at an exponential rate. Enterprises were initially demanding just one or two communication channels for their customers, but now consumers expect to be able to reach companies through any channel, from email and phone, to smartphone apps, web chat and social networks, and businesses must meet that demand in order to deliver a quality customer experience. To stay ahead, Jonathan concluded, “businesses must build an integrated omni-channel customer service strategy so they can connect with customers wherever they are to drive loyalty and increase sales.” According to Jonathan, customers are your primary source of upsells, cross-sells, renewals, customer references, social media evangelists, community-delivered support, market research, product feedback and new business referrals. By tracking and leveraging your customers’ data and previous interactions through a CRM solution like Salesforce, businesses can drive a more meaningful discussion and faster resolution. “Customer and business success is about retaining and nurturing revenue growth through existing customers while building brand advocates”, says Jonathan. Ashley Unitt, CTO of NewVoiceMedia & Company Advisor Richard Pickering established NewVoiceMedia in 2000. Prior to 2006, these two great entrepreneurs funded the company with money earned from several prior businesses they’d been involved in, -including First Data Corporation, Egoboo and TeamPhone. UK-based NewVoiceMedia now has offices in New York, San Francisco, Sydney and Continental Europe, boasts more than 300 employees worldwide and has become a leading provider of omni-channel cloud customer contact technology. NewVoiceMedia revolutionises the way organisations connect with their customers worldwide, enabling them to deliver a personalised and unique customer service experience and drive a more effective sales and marketing team. According to Ashley Unitt, the idea behind the business originated in the late 90s, when he felt that the call centre industry was dominated by large players all selling expensive proprietary kit. Upgrading or adding component to the system would drive more cost and complexity, and even had to be carried out by IT departments. This meant that good call centre technology was only available to the largest companies with the deepest pockets. Ashley concluded that everything was broken and he needed to fix it. He saw that the way out of this was to embrace open standards and move the intelligence from the customer’s premises into the network. NewVoiceMedia’s ContactWorld for Service and ContactWorld for Sales products are cloud customer contact solutions that empower customer service and sales professionals to deliver a personalized and unique customer service experience and drive a more effective sales and marketing team. The ContactWorld platform, which integrates with Salesforce, -provides a market leading 99.999% SLA, and is handling millions of calls, for thousands of reps working across the globe. ContactWorld QuickStart is perfect for small and mid-size businesses. It is incredibly quick to set up and capable of providing a personalised service to every enquiry and helping your sales teams by improving efficiencies. NewVoiceMedia looks after all the network, infrastructure and software in its data centres, freeing up businesses to manage what matters to their customers. As there is no physical infrastructure to install and configure, NewVoiceMedia can complete deployment in just hours. ContactWorld is based in ‘the cloud’, enabling efficient use of resources without the overhead of keeping a physical centre running 24/7. With NewVoiceMedia’s flexible licensing model, you can scale up to meet extra demand when you need it. NewVoiceMedia offers flexibility and better service level availability with zero Capex. Spanning 128 countries and six continents, NewVoiceMedia’s 400+ customers include PhotoBox, MobileIron, TNT, Lumesse, Qlik, JustGiving, Canadian Cancer Society and Wowcher. The company’s mission is to become the global leader in the provision of enterprise-class cloud communications technology, with the vision of continuing to innovate ahead of the competition and further increase global adoption of the ContactWorld platform to fulfill customers’ needs. In 2012, NewVoiceMedia achieved a place on Red Herring’s Top 100 Europe list, which honours the year’s most promising private technology ventures from Europe. NewVoiceMedia also celebrated a double win at the 2013 Private Business Award. Jonathan Gale achieved ‘CEO of the Year’ -and the company was honoured with the ‘Rising Star’ award for the South East region. The company also won the Best Technology Partnership with SHL, the global leader in talent measurement, as well as the Customer Contact Association (CCA) Excellence Awards in 2013. NewVoiceMedia ranks among the world’s Top 100 Cloud Service Providers (CSPs), according to Penton Media’s fourth and fifth -annual Talkin’ Cloud 100 report. The company secured Wowcher and Ukash as finalist for the UK Customer Experience Awards. NewVoiceMedia’s ContactWorld helped Ukash scoop the London & South East Contact Centre Forum Award. In addition, the company has been recognised as one of the Best Companies to Work for 2014 by The Sunday Times. NewVoiceMedia helped alternative finance company Platform Black earn ‘Best Payables Supplier Financing Solution’ at Global Finance magazine’s World’s Best Supply Chain Finance Providers Awards plus the ‘innovation in supporting business or enterprise’ award at the Financial World Innovation Awards 2014. TMC, a global integrated media company, recently named ContactWorld for Service a 2015 CUSTOMER Product of the Year Award winner. The company also ranks among the London Stock Exchange Group’s 1,000 Companies to Inspire Britain, an index of the UK’s most exciting and dynamic businesses. NewVoiceMedia has achieved an impressive 95% customer satisfaction globally, and continues to drive innovation to further revolutionise the way organizations connect with their customers worldwide. The company recently announced that it grew its international new business by 528 percent in FY’2015, while continuing to expand its UK base.